Living up to its long-standing reputation TCL brought a traditionally abundant roster of new phones to MWC 2018. Also, in keeping with tradition, most of these come in a large number of versions, with plenty of optional features. That being said, the Alcatel 5 is a clear stand-out this year. Just like the rest of its siblings making a debut at the Barcelona venue, it comes with a trendy 18:9 display. However, TCL took things one step further by reducing the bottom chin on the handset to a minimum. Quite a distinct look if nothing else. 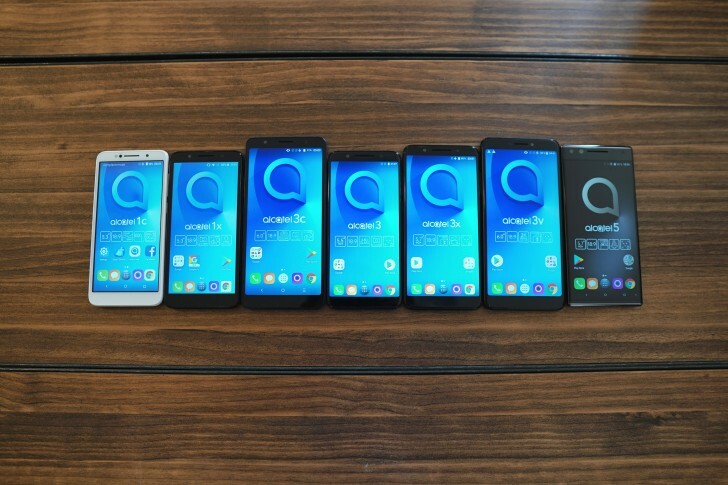 Following the Alcatel 5 in the lineup is a quartet a Alcatel 3 devices. The top tier of these being the Alcatel 3V. It comes with a much more traditional look, while still adopting an extra-tall 18:9 panel. it's a sizeable 6-inch one with FullHD+ resolution. If you find 6 inches a little bit unwieldy, the Alcatel 3X brings that down to a more manageable 5.7 inches. It still keeps the trendy new 18:9 aspect, with a slight decrese in resolution and most other specs. Surprisingly, RAM is unaffected with a 3GB version also available. You also get a very different finish on this one. Then comes the Alcatel 3 with a smaller display diagonal still, at 5.5-icnhes. The 18:9 aspect is intact, but unlike its 3X sibling, the regular version lacks a second camera on the back and is available with a glossy finish on its plastic body. The Alcatel 3C also made an appearance at the show, but it has been official for some time now. It's the cheapest member of the 3 series that comes with a screen the same size as the 3V, but drops the resolution to HD+. Moving on, we have the Alcatel 1X. It is the smaller than any of the 3 series at 5.3 inches and the resolution is pretty low at 960 x 480 pixel. Still, interestingly enough, the panel is also 18:9 - maintaining a nicely consistent look throughout the lineup. It is also part of Google's new Android Go program, which promises better performance for limited hardware. Alcatel 1X Specs Body: Plastic, with suede and soft touch finish; 147.5 x 70.6 x 9.1mm, 151g. Screen: 5.3-inch, 18:9, 960x480pixel, IPS LCD Rear Camera: 8MP or 13MP, f/2.0 lens, EIS, LED flash Front Camera: 5MP, LED flash Chipset: MediaTek MT6739, quad-core 1.28GHz CPU Memory: 1GB/2GB RAM, 16GB + microSD OS: Android 8.1 Oreo (Go edition) Battery: 2,460mAh Connectivity: Optional dual SIM (4G), Bluetooth 4.2, GPS, Wi-Fi b/g/n, optional NFC, USB 2.0 Type-C Misc: Optional fingerprint reader Lastly, there is the Alcatel 1C. It has the same display, chipset, memory and camera setup as the 1X, but runs the custom alcatel breed of Android and has metal on its back. It is running Android Nougat too, which is rather dated at this point even for an entry-level handset. Moving on, we have the Alcatel 1X. It is the smaller than any of the 3 series at 5.3 inches and the resolution is pretty low at 960 x 480 pixel. Still, interestingly enough, the panel is also 18:9 - maintaining a nicely consistent look throughout the lineup. It is also part of Google's new Android Go program, which promises better performance for limited hardware. Lastly, there is the Alcatel 1C. It has the same display, chipset, memory and camera setup as the 1X, but runs the custom alcatel breed of Android and has metal on its back. It is running Android Nougat too, which is rather dated at this point even for an entry-level handset. Body: Plastic, with metallic finish; 152.3 x 71.1 x 8.4mm, 144g. Body: Plastic, with sleek shine casing and 3D curve back; 162 x 76 x 8.05mm, 155g. Body: Plastic, with metallic or glossy finish (market dependant); 153.5 x 71.6 x 8.5mm, 144g. Body: Plastic, with glossy finish; 147.1 x 68.8 x 8.5mm, 145g. Body: Plastic, with suede and soft touch finish; 147.5 x 70.6 x 9.1mm, 151g.